Keith Bender has become one of the hottest comedians on the rise today. A native of Chicago , in the lunchroom and on the school bus is where Keith would find his niche for making people laugh. After being challenged by a friend to get on stage to see if he was really funny, Bender began writing material and taking command of the stage. As fate would have it, comedy was a perfect fit for Keith. The very next month, after taking the comedy challenge, he won his first contest and reigned supreme over his nine competitors. As a result, Bender was asked to host the local comedy club’s show the following week. Since Keith’s explosive beginning, he continues to thrive in the world of comedy. In 2007, he won the “Funniest Person in Cincinnati ” at Go Bananas Comedy Club. In 2005, he won The Funny Bone’s “Funniest Person in Columbus , Ohio ” contest as well as the “Coming to the Gospel Stage Funniest Comedian” contest without telling a single church joke. Bender has performed on many stages including the Laugh Factory, The Comedy Store and the famous Stardome. He has worked with various comedians including D.L. Hughley, Kathleen Madigan, Jim Breuer, Vince Morris and John Witherspoon. 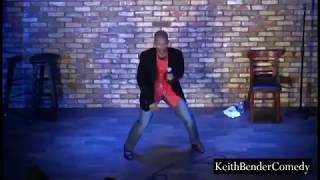 Keith’s physical style, creative voices and sound effects bring laughter to all.